It’s a fond farewell to The Borders and the fine folk of Selkirk with many thanks to colleagues at The Haining and in the Borders museums, galleries and businesses for their collaboration. Particular thanks to those who have added to our journey with their own Linen Story, building our intriguing and engaging Borders Linen Storybook. We have a new locality linen theme: ‘Trade Routes, from Shipping Lanes to Instagram’. 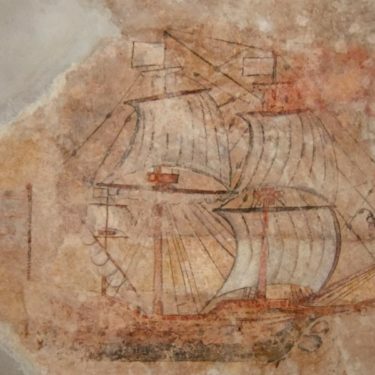 The image above is a mural which can be seen at our venue uncovered during the restoration by Scottish Historic Buildings Trust. Kirkcaldy was once Scotland’s second biggest port after Leith: ships sails and rigging were made of linen, cargo was protected by tarpaulin (‘tar covered linen’) and flax and linen transferred between Kirkcaldy, The Low Countries and the Baltic States. What of Scotland’s Linen Trade Routes now? In addition we are working with allied venues and colleagues across the county to explore a rich linen heritage and contemporary design and manufacture. Full programme details will be posted on our Website Tour Page in the coming days. “Designer Table Talk” with Lorna Brown, artist designer born in Fife, who will include her own Linen Story in collaboration with Peter Greig’s of Kirkcaldy, Scotland’s only surviving linen manufacturer. You can view Lorna’s work for ‘Blessed Unrest’ here. “Linen and the Lang Toun” A new urban walk in collaboration with Murdo Eason of the Fife Psychogeographical Collective. Check out their wonderful allied website ‘From Hill to Sea’ here. These events are free: please register your interest via our website in the coming days. 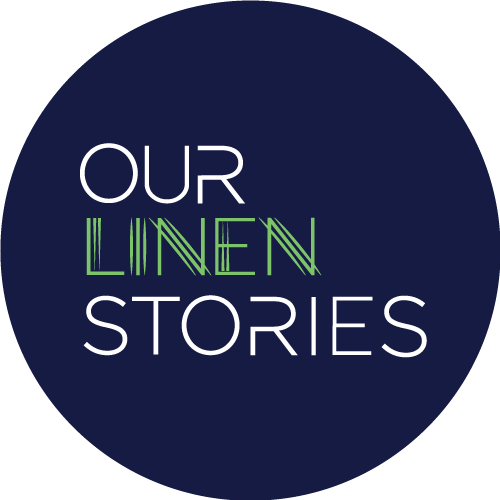 As is our custom, we will start gathering Your Linen Stories at Our Linen Stories stall this time at Kirkcaldy’s Farmers Market on the morning of Saturday 25th August. We’re looking forward very much to presenting new stories and new objects in Kirkcaldy together with the stunning Contemporary Design using Flax and Linen that forms the core of this exhibition in the contexts of Industrial heritage, European partnerships and Material Innovation. A word of thanks to Eilidh Young who is moving on from Gayfield.